Old time radio quiz and game shows were never considered a big priority for the networks, although they were very popular with both sponsors and listeners. Sponsors loved the quiz shows because the format had great potential for forms of product placement and gave a lot of advertising power for a low budget. Audiences loved them because they were filled with spontaneous fun , following the on-air contestants as well as playing along. 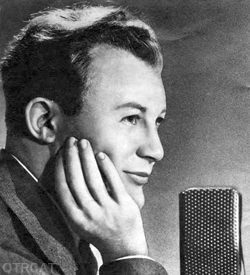 Censors were a little more ambivalent; because radio game shows were both live and unscripted, giving the censors relatively little control over them. The radio game show has evolved into the explosion of competition based reality TV shows that began cropping up after 2000, such as Survivor, America's Top Model, The Apprentice and the Big Brother franchise. 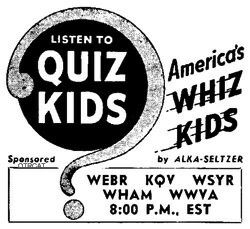 The original radio quiz shows were a lot more innocent, but a lot more fun! The Rare Game Show Collection is filled with sample episodes of some great quiz programs -- including many rare episodes. The collection will give you a great introduction to this fun type of old time radio entertainment. Are You a Genius was a rare type of quiz show all by itself; there were no on-air contestants or sponsors. 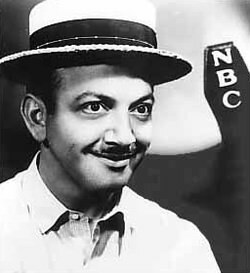 The show was produced as entertainment for Troops overseas by AFRS, featuring Mel Blanc , voice of Warner Bros. Looney Tunes, in a one man show asking trivia questions. On Beat the Band contestants would send in musical questions trying to stump the members of the Ted Weems Orchestra. The Better Half was a "Battle of the Sexes" show pitting husbands and wives against each other in a question and answer format. On Can You Top This the audience sent in jokes, and it was up to the panel members to each come up with a funnier joke on the same topic, creating a great treasure of laughter. Guess Who? gave Happy Feldman the chance to interact with "ordinary people" who would listen to audio clips of famous people and Guess Who they were listening to. Information Please again featured questions sent in by listeners, this time with a panel drawn from New York's literary community, who often gave very intelligent and entertaining answers. Although Information Please never seemed to put on airs, it did lead to its exact opposite coming to the air on It Pays to Be Ignorant; the panel here was far from the intelligentsia, it is debatable if they could even tie their own shoelaces! All of which lead to great frustration for the host and good Fun for listeners. Kay Kyser's Kollege of Musical Knowledge may have been more about hot jazz than getting the questions right or wrong, but audiences loved it. Mind Your Manners host Allen Ludden led a discussion with "typical teenagers" on typical teenage problems and issues. Art Linkletter hosted People Are Funny which set up outrageous pranks and then broadcast how unwitting participants reacted to them. Queen for a Day called on typical house wives to tell their stories--the more tears the better. The teller of the inning story was showered with glamorous gifts and usually given the assistance needed to solve their problems. Fast answers on a variety of subjects was the Key to winning Quick as a Flash . Quiz Kids used a rotating panel of Children who were selected for their intelligence as well as their personalities. Kids not only say the darndest things, sometimes they answer questions that would stump most adults! People who had missed their great chance at true love were able to try again to make it work when brought back together with their old loves on Second Chance. Take It or Leave It contestants were asked increasingly difficult questions. If they gave a correct answer, they could take the prize money, or try for a new question and a bigger prize. Contestants were given an almost impossible question on Truth or Consequences. When they failed to answer the question correctly, they would face the consequence, the most outrageous and embarrassing stunt the show's writers could come up with! Twenty Questions was a radio version of the popular parlor game that almost every family has played, but on the radio we got the hear the Van Deventer family play and interact. Vox Pop took their microphones and their questions to various location to hear "the voice of the people". The featured guest on Which is Which was hidden from the studio audience behind a curtain. The audience then would have to guess whether the guest was an actual celebrity or a clever impersonator. 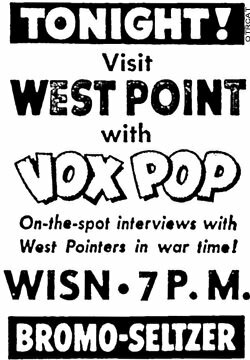 Finally, perhaps the funniest game show on radio, You Bet Your Life gave Groucho Marx a chance to play the character loved by generations, sharing his own brand of warm-hearted cynicism. Be the first to comment on "Rare Game Show"